Originally from the beautiful countryside of western Montana, I moved to Las Vegas in 1987, and have been in the landscaping and gardening industry here in the valley for over 28 years. After Graduating from Clark High School in Las Vegas I obtained a degree in Horticulture at CSN. I worked as the Director of Horticulture at the Beau Rivage Resort in Biloxi, MS and at other resorts in Las Vegas including The Mirage Hotel and Shadow Creek Golf Course. I have had a passion for growing food in the desert since I was young, and have successfully proven an uncanny ability to grow vegetables and fruit trees throughout our harsh desert climates in Nevada. I am married to the lovely Brittany Vellinga (co-owner and operator of Garden Farms of Nevada) and together we have five beautiful children, and one grandchild. In my spare time, I enjoy fly fishing, food preservation, spending time with my wife and family and (of course) gardening. 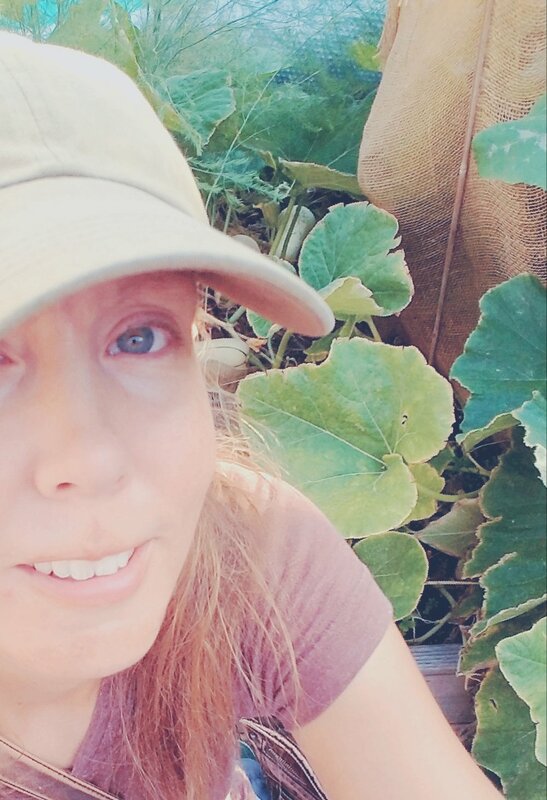 In addition to being a busy mother of five children and one grandchild, I work on the farm and service some of the residential and school gardens in Las Vegas. I love working with the kids and others, putting my 15+ years of gardening experience in Las Vegas to good use. After graduating High School I pursued further education with the travel and tourism industry. In addition to Working at Garden Farms of Nevada, I have worked as a day care specialist, substitute teacher, swim teacher and am a certified CPR instructor. My hobbies and interests include gardening (of course), camping, spending quality time with my kids, sewing, running, walking, food preservation and exercise. I grew up on the eastside of the Las Vegas Valley and have been growing food for over twenty years. I am passionate about growing and sharing delicious high-quality food, fermenting and preserving the bounty, and showing students the joys of getting their hands dirty in the garden. Growing in the desert is great! There are many native foods if you don't mind being adventurous, the number of arid-adapted crops and varieties seems to be increasing each year, we can grow and harvest the entire year, and we have a smaller variety of pests and diseases to contend with. Working in the garden fulfills a visceral need that I think exists in all people. The peace, focus, and relaxation supplied by a day in the garden is an unrivaled level of satisfaction. Food that you grow yourself tastes better. Fresh, perfectly ripe produce that you picked in pajama pants will make grocery store produce seem like tasteless cardboard. Once someone tastes the difference, they often won't even need any other reasons to start growing - But, there ARE more reasons. Conventional Industrial Agriculture uses a myriad of non-renewable, petroleum-based and dangerous poisons that destroy soil life, eventually resulting in desertification, and require ever-increasing applications. The residues remain on the produce and accumulate in the bodies of the people who eat it, resulting in weakened immune systems, disease, and in some cases, effects at the genetic level that can damage organs. Growing a portion of your own food near, or at, your home helps you avoid dangerous chemicals while giving you superior-tasting food, all while helping the environment and future generations. Win win. I was born and raised in Las Vegas, NV. (Yes, a real unicorn!) After spending some time in the rain forests, dry forests and cloud forests of Costa Rica, I became fascinated with plants and their life cycles. Upon my return, I moved to North Carolina and became a certified clinical herbalist, and began working with children’s ailments. Wanting to get back to my roots, I moved back to the West Coast where my focus shifted towards agriculture. I fell in love with the idea of replacing lawns/ornamentals with edible varieties, and creating a sustainable environment through permaculture principles to recreate natural ecosystems. When I joined the Garden Farms team four years ago, I felt so lucky to find a job and a community that aligned so perfectly with my passions! Being able to educate children with these ideas is not only securing a system of sustainability for the environment, it is creating a system of sustainability for their own food access as well. One system of sustainability I have adopted into my daily life is catching my ice-cold water into a bucket while I wait for it to warm up before showering. That’s about 2 gallons I get to water my plants with that would otherwise have gone “down the tubes”! Originally from Las Vegas, NV, I have a passion for edible urban landscapes. After furthering my education in Environmental Horticulture at the College of Southern Nevada, I collaborated on many projects providing food security and sustainability within my community. I have worked to develop school garden framework for the desert southwest and have steered organizations to design beneficial food systems which also preserve natural resources. Having recently transplanted to Eugene, OR, I am excited to share my devotion to the endless opportunities growing food can provide. Enjoying time in the garden and kitchen with my husband, two daughters, two inquisitive dogs and as many friends and family as possible is my favorite hobby! I have been gardening in Southern Nevada and the surrounding region for 18 years. I enjoy working with home gardeners to develop site-adapted planting plans over the course of several growing seasons. As one farmer among many at Garden Farms, I have had the opportunity to help weave customer feedback and localized environmental feedback into a larger garden patchwork here in the Valley. Overlooked items in your home can be repurposed as essential additions to your gardening toolkit -- and this also goes for the toolkit itself! Once, on a whim, I repurposed a collapsible laundry hamper with rope handles as a garden carryall, and to this day it works better for me than any store-bought gardening tote advertised as such. I bring it with me to gather up plants for easy transport, to haul debris away, and to move miscellaneous supplies around. It's also a real space saver, folding flat when not in use. Hello everyone, I'm Farmer Ryan. I grew up in Honolulu, Hawaii surrounded by bananas, mangoes and even lychee trees. Growing up in Hawaii I was intrigued by the variety of plants and trees that can only be found in the tropical climates. When we moved to Vegas I learned how to grow vegetables. I started with my father learning Aquaponics together, and eventually moved on to growing in soil. My father has taught me everything I know about gardening and I appreciate all the knowledge that he passed down. I'm constantly learning new techniques like companion planting, natural pesticides and what grows well in Vegas. When I was going to college I had the opportunity to start giving nutrition lessons to students at a couple of the school gardens in town. Watching kids get excited about vegetables was the best thing ever!! I loved working with them & teaching them why veggies are so great for them. I saw how much of an impact it made on the kids & continued volunteering for a couple of years. Of course it's hard to spend so much time in gardens & not fall in love with farming! I loved seeing how the plants grew, learning how to care for them, and of course eating the most delicious produce of my life! I don't think I'll ever stop growing food thanks to my experience with Garden Farms. I'm so lucky I get to work as a farmer with them now! My gardening tip to you all: Be patient and don't take it too seriously! I became involved in growing my own food when I recognized that the world is facing a major climatological challenge, and thorough environmental science, we can overcome this challenge. I simply seek to integrate nature into not only my life, but the lives of those in my community. I’ve found that the best way of accomplishing this is through growing a wide variety of plants, and teaching others how to do so as well. I thinks that it's important to know what plants you can use wherever you are. I always recommend that you look into what plants are useful, edible, and beneficial for you and your surroundings. Hi there, my name is Dana. I am a father of two beautiful children and a husband to one amazing wife. I was originally born in Denver, Colorado and I’ve now been in Las Vegas for over 20 years. For the last 15+ years I have dedicated much time and energy to creating a sustainable environment on my own property along with teaching kids, neighbors and friends alike how to grow their own food. My favorite things to grow in the Las Vegas desert are heirloom chiles because I love making hot sauce! I originally got into sustainability and growing soil in order to grow the healthiest food. I watched many documentaries and did tons of research about how our food was processed, where it came from and what we were eating. I realized we were being slowly poisoned, and I couldn’t allow that to happen to my family and I. At home we have over 20 fruit trees, are actively engaged in “Back to Eden” methods, and have many garden beds full of healthy organic soil to grow healthy organic food! One love y’all! I’m very passionate about growing my own food and teaching the concept to anyone who will listen. Growing food for ourselves has been lost through busy lifestyles and the ease of grocery stores. There is something so satisfying in self-reliance and having everything on your table grown from a seed you collected from the previous year’s harvest. For over 10 years I have taught myself how to grow through trial and error as well as being a member of a local community garden, and I’ve really enjoyed helping countless people remedy problems in their own gardens. I’ve taken classes through Springs Preserve, community colleges and university extension offices, and I’ve also participated in planning the vegetable gardens at the Springs Preserve through extensive classes on the subject. I started out saying, “Thank goodness my family won’t starve this winter because we have a grocery store to!” but now my own garden is better than the local grocer, and we have everything we need right at home! I studied Environmental Science at the University of Michigan and wanted to do more that was related to sustainable agriculture after learning about how our food systems work. I think the way in which we produce food can do a lot in helping to improve the health of humans, animals and the environment we live in. Gardening and farming also encompass a lot of the things that interest me most: biology, wildlife, conservation and being outside everyday. I have worked on garden education programs while serving in the Peace Corps in Ecuador, ate my weight in tomatoes while working on an organic vegetable farm in Wisconsin, managed Oregon Food Bank's garden education program empowering and teaching food-insecure families how to grow their own food, and have enjoyed gardening most everywhere I've lived with containers or community garden plots. I'm a senior at Somerset Academy, and I am a part of their school garden program. I first became interested in growing food while surrounded by gardens in Alaska, and every other place I’ve lived along the way. When I moved to Las Vegas, I didn't notice much green here or anything of color besides the desert, so I joined the garden club at school which is taught by Garden Farms of Nevada. I must have done a great job, because Cabble recruited me to join their team! I started farming when I was in my early teens, in New Jersey. My stepfather used to make me turn over the dirt in his garden when I needed discipline. The garden was large and this sometimes happened 2-3 times a week! I took an interest in what he was doing and carried this love for gardening to this day. I am always amazed when something I put effort into, flourishes. I’m a part time instructor at the College of Southern Nevada where I teach a 3-week course in vegetable gardening each semester. I’m a certified personal trainer with a specialty in senior fitness. My philosophy is that fitness and nutrition are intertwined: If you want to change your diet, grow it. If you grow it you will eat it.